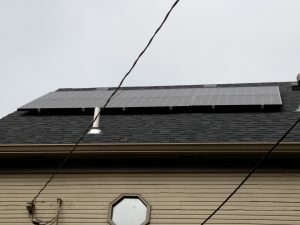 Here’s another satisfied residential solar customer review located in Dayton’s historical Oregon District. “OGW Energy Resources have proven themselves as an excellent industry leader, proactive and conscientious in the work. OGW understands all aspects of their own business, from initial design and contract, including permitting and priority scheduling, to installation and the logistics necessary for minimum maintenance. Their contract prices are industry competitive, very reasonable for the time and labor involved, and significantly lower than other solar solution providers I had considered before meeting them. Although any permanent solar installation requires planning and foresight, and likely involves a number of steps to completion, OGW makes this easy for customers by working courteously and efficiently, keeping any hassle to a reasonable minimum. I cannot really praise the virtues of buying into solar highly enough. Solonoid technology has been around for some fifty years or more, coming to public attention and then disappearing into the background again. Predictably, the number one complaint/objection has tended to be that it’s too expensive (or that it won’t help because solar would need to work in places without enough sunlight). I’ve also heard before that the average person is likely to replace every single battery they ever use, rechargeable or otherwise, before needing to replace a single well-made solar panel even once. The obvious truth is that solar power production has tended to become more affordable with growing interest, as people have also predicted. Considering that solar-produced electricity is a renewable resource, even though it does require manufactured quality materials if it’s going to be durable, solar power is as economical as it is likely to become before any mass cultural integration makes paneling ubiquitous. I was surprised by additional details I hadn’t considered: a roof-module assembly can produce the equivalent of and up to several times a building’s typical electrical consumption while occupying only a small fraction of the surface area available. By example, this works out to approximately 4:1 or greater during the typical hour while using 1/8th of the roof or less for my house. The actual math has worked out to a little over 100kWhr of electricity produced and recorded during the first month since installation and a carbon offset equivalent to about two trees. A responsible and realistic person cannot expect to do more for everyone in the future with less and succeed at it. In summary, OGW Energy Resources does excellent and timely work at a quality price and I’ve found doing business with them a pleasure. If you or anyone you know has been considering making a worthwhile decision about renewable energy sources but keeps putting it off until later, I would highly recommend you speak with a representative at OGW at your earliest convenience. You’ll be glad you went solar once you have.